Original Editors - Collen Nalley and Abbye Senn from Bellarmine University's Pathophysiology of Complex Patient Problems project. Diabetes Mellitus (DM) Type 1 is a chronic disorder characterized by hyperglycemia (high blood sugar) and disruption in metabolism of carbohydrates, fats, and proteins. It occurs because of little or no insulin being produced by the pancreas. It occurs in children or young adults, usually before the age of 30. It typically has an abrupt onset, with most individuals having a thin or normal body weight at diagnosis. Type 1 Diabetes is managed by diet, exercise, and insulin injections. It can result in serious vascular complications and neuropathies and can be a major cause of cardiovascular disease and strokes. It is also the leading cause of end-stage renal (kidney) disease, non-traumatic amputations in the lower extremity, and new cases of blindness. Autoimmune, environmental, and genetic causes may put individuals at risk of developing Type 1 DM. 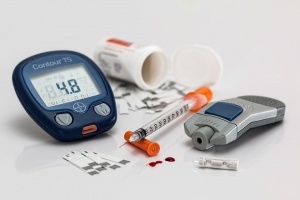 If patient is on epinephrine, glucocorticoids, or growth hormone, there may be an increase in blood glucose levels, thus an increased level of insulin may be needed. 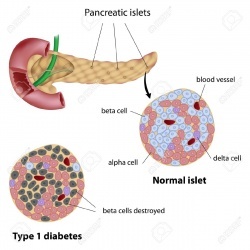 Type 1 Diabetes is caused by the autoimmune destruction or absence of pancreatic islet cells (B-cells). Pancreatic islet cells secrete insulin, a hormone that stimulates the body to take up glucose from the bloodstream. When insulin secretion is reduced, blood glucose levels are increased in the circulating blood, and a reduced amount of glucose is transported into cells. The impaired insulin secretion leads to impaired protein synthesis because amino acids use insulin for transportation through the body. Because glucose is not being taken up into cells to be utilized for energy, the body will break down adipose tissue to release glucose. The breakdown of fat causes ketone formation, which can eventually cause Diabetic Ketoacidosis (DKA) to occur. DKA can be life threatening if not treated. The accumulation of glucose in the blood leads to hyperglycemia. The cause of the autoimmune destruction of pancreatic B-cells is still being researched, but genetics, viruses, allergens, and environmental exposures are all potential causes. It has been shown that all people with type 1 diabetes have at least one similar gene. Individuals who have a primary family member with type 1 diabetes have a 5-6% chance of developing the disease, while individuals with no family history of the disease only have a 0.4% chance of developing type 1 diabetes. Systemic Involvement is due to the disease's effect on nerves and vessels. Goal is to maintain blood glucose levels between 80 and 120 mg/dL. This is done through the modification of diet, exercise, and medication. Should not exercise alone in case of hypoglycemic episode. Type 1 diabetics may need to decrease insulin dose or pump activity during exercise, as well as increase food intake, with prolonged activities (10-15g CHO with every 30 min. of exercise). Exercise increases insulin, which can drop glucose levels to low dangerous ranges, especially with high intensity or prolonged duration exercise. Monitor glucose levels before, during, and after exercise. Watch for confused, lethargic state or change in mental status in DM patient - have patient do finger stick check for glucose levels if available and immediately refer to physician. 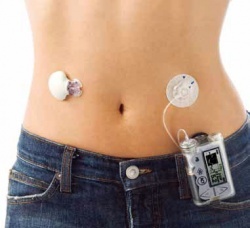 IIf patient has an insulin pump, diabetic ketoacidosis (DK) can occur quicker if there is an interruption in insulin delivery. Monitor patient carefully for excess perspiration, increased motion at pump site, and temperature during exercise. Diabetic Ketoacidosis (DKA) can occur in type 1 DM patients . DKA usually occurs in children and young adults with undiagnosed DM, or when an individual with type 1 diabetes has increased insulin needs Be stress, trauma, surgery, infection, etc. Metabolic acidosis/HNNC (hyperglycemia hyperosmolar nonnegotiable acidosis) occurs more frequently in adults with type 2 diabetes. 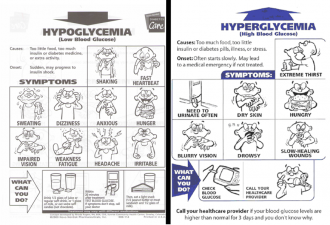 <70 mg/dl is considered hypoglycemia; This is a major complication with insulin users (type 1 DM mainly). It usually occurs from decreased food intake or an increase in physical activity. Hypoglycemia interrupts oxygen consumption in nervous tissue. Patients using beta blockers are at a higher risk for developing hypoglycemia. If hypoglycemia is suspected, 10-15 g of carbohydrate (CHO) should be given ( this equals a ½ cup of juice/cola, 8 oz. milk, 2 sugar packets, or 2 oz. honey). It is good to keep these snacks in the clinic, but always ask patient about food allergies before administering food. ↑ 1.00 1.01 1.02 1.03 1.04 1.05 1.06 1.07 1.08 1.09 1.10 Goodman CC, Snyder TEK. Differential Diagnosis for Physical Therapists: Screening for Referral. 5th ed. St. Louis, MO: Saunders/Elsevier; 2013: 425-432. ↑ 2.0 2.1 2.2 2.3 American Diabetes Association. Type 1 Diabetes. Available from: http://www.diabetes.org/diabetes-basics/type-1/?loc=util-header_type1 (accessed 8 April 2016). ↑ 3.0 3.1 Medline Plus. Diabetes Type 1. https://www.nlm.nih.gov/medlineplus/diabetestype1.html (accessed 6 April 2016). ↑ Wikipedia. Peripheral Artery Disease. https://en.wikipedia.org/wiki/Peripheral_artery_disease (accessed 9 April 2016). ↑ Franc S, et al. Insulin-based strategies to prevent hypoglycaemia during and after exercise in adult patients with type 1 diabetes on pump therapy: the DIABRASPORT randomized study. Diabetes, Obesity, and Metabolism 2016; 12. http://www.ncbi.nlm.nih.gov/pubmed/26264812 (accessed 7 April 2016).